The introductory video on the Site5 homepage produced expectations of a high-quality, low-cost shared hosting service. Further, our initial experiences with the company’s cheapest hosting plan reinforced this view. Taking advantage of the 30-day free trial, we found Site5 hosting to be easy to use and maintain. However, the results of our 10-day Dotcom Monitor uptime and speed testing could not have been more disappointing. Uptime was less than 100% and server speeds were below average. Despite our highly positive initial judgment, and after careful consideration, Site5 has been awarded 4 stars and the NCM Online designation of RECOMMENDED WITH RESERVATIONS. Having noticed Site5 within the results of searches for cheap web hosting, we decided they would make a good candidate for NCM Online testing and review. As we had not heard anything about the company, our first impression was based on a visit to their website. We found it to be easy to navigate, well designed, and informative. The homepage Introductory Video created expectations of a high-quality, fully-featured, low-cost web hosting service. Site5 offers three relatively low-cost shared hosting plans with pricing that ranges from $4.95 per month up to $13.95 per month depending on the package and billing cycle selected. Further, shared plans include a 30-day free trial when you enter the “FREETRIAL” coupon code at checkout. All three shared plans feature a choice of multiple worldwide datacenters. The default datacenter is located in Dallas. Datacenters located in the following cities are available at an additional cost of $1.00 per month: Chicago; Los Angeles; San Francisco; Seattle; New York City; Washington, DC; Atlanta; Miami; Phoenix; Montreal, CA; Toronto, CA; Vancouver, CA; London, UK; Amsterdam, the Netherlands; Bucharest, Romania; New Delhi, India; Singapore, Singapore; and Hong Kong, China. Datacenters in the following cities are available at an additional cost of $5.00 per month: Joao Pessoa, Brazil; Sao Paulo, Brazil; and Sydney, Australia. All else being equal, utilizing a datacenter near your site’s primary audience will enhance page-load speed and reliability. We find it to be an excellent option for local and regional websites. However, if your site’s audience is similar to ours — worldwide in scope, but primarily US-based — the Dallas datacenter remains the best choice. In addition to a choice of datacenters, all three shared plans include unlimited diskspace, unlimited bandwidth, unlimited e-mail accounts, unlimited MySQL databases, unlimited subdomains, unlimited FTP/SFTP accounts, free site migration, nightly server backups, the cPanel control panel, the Softaculous applications installer (250+ applications included), server-wide shared SSL certificate, Cron Jobs, AW Stats, the CloudFlare content delivery network, and more. Shared plans are backed by 24×7 technical support, a 99.9% uptime guarantee, and a 45-day money back guarantee. Added-cost options include dedicated IP addresses (starting at $3.00 per month) and malware protection/cleanup ($49.99 per site per year). The cheapest shared hosting plan, hostBasic, costs $4.95 per month for a 2-year billing cycle or $5.95 per month for a 1-year billing cycle. The hostBasic plan includes all of the common features listed above, and is limited to one website. The next-cheapest shared plan, hostPro, costs $8.95 per month for a 2-year billing cycle, $9.95 per month for a 1-year billing cycle, or $10.95 per month for a monthly billing cycle. The hostPro plan includes all of the common features listed above, as well as the ability to host an unlimited number of websites on a single account. The highest-priced shared plan, hostPro + Turbo, costs $11.95 per month for a 2-year billing cycle, $12.95 per month for a 1-year billing cycle, or $13.95 per month for a monthly billing cycle. The hostPro + Turbo plan includes all of the common features listed above, as well as the ability to host an unlimited number of websites, while adding the option to provide a separate cPanel for each website on the account. 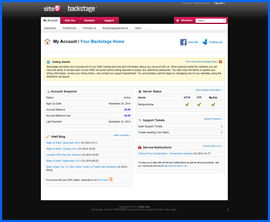 Screenshot of Site5 Backstage account dashboard. Click to enlarge. In addition to shared hosting, Site5 offers reseller hosting plans; fully managed, unmanaged, and cloud VPS (virtual private server) plans; as well as cloud web and reseller hosting plans. As is our practice for purposes of testing and review, we selected the cheapest available plan — the hostBasic — and proceeded to checkout. A model of user-friendly design, Site5 utilizes a four-step checkout process that is both intuitive and consumer friendly. Step 1 provides for the selection of a datacenter, hosting plan, and billing cycle, as well as the addition of a coupon code. The first option is to select a datacenter from the list of 22 worldwide locations provided. We left the default selection (Dallas) in place. Next, we selected our hosting plan from the pulldown menu. Once again we left the default selection (hostBasic) in place. We then selected the 6 month billing cycle from the choice of 6, 12, or 24 months. The “FREETRIAL” coupon code had already been entered for us, so we clicked the “Next” button. 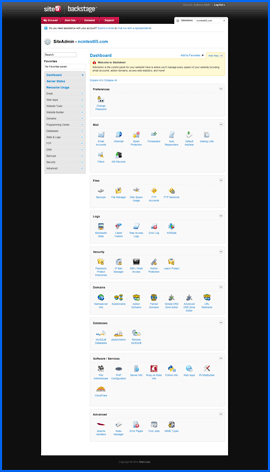 Screenshot of custom Site5 cPanel control panel. Click to enlarge. Step 2 requires the entry of a domain name to be associated with the account with the option to purchase a new domain name. We selected “Use a domain name you already own” and entered in the form field. We then clicked the “Next” button. Step 3 requires the entry of billing information and password selection. We entered our contact details and a password. Next we selected the PayPal payment option and clicked the “Next” button. Step 4 provides the opportunity to review and edit your hosting plan selections and account details. The recurring cost, coupon code discount, and the amount due today are all clearly displayed. We agreed to the Terms of Service and clicked the “Click to complete your order” button. Within one minute of submitting our order, we received the “Backstage Login Info” e-mail. While it did not provide the details required to set up our test site, it did allow us to access the “Backstage” account dashboard (screenshot above right) as well as the Site5 custom cPanel control panel (screenshot right). Two minutes later, we received “Thank You” and “How to Submit Payment” e-mails. Nine minutes later, we received the e-mail we were waiting for. With the subject line of “Welcome New hostBasic (Dallas) Customer,” it provided the account details (including nameservers) required to set up our test site. After updating the nameservers at our domain registrar, we uploaded our test site, set up our Dotcom Monitor testing, and waited for test results data to accumulate. All web hosting services reviewed by NCM Online are purchased and subjected to our 10-day test for reliability and speed. Site5 testing began on 11/27/14 and concluded on 12/6/14. Unfortunately, the test results were not what we hoped they would be. Site5 Uptime Test Results Chart. The thin red vertical line indicates downtime. Click to enlarge. 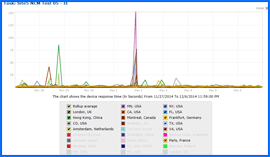 On 12/01/14 at 9:37:51 PM, the server began experiencing problems that continued until 12/01/14 at 9:53:30 PM. In all 13 attempts to access the site proved unsuccessful. The errors were all identical TCP 10060 errors (A connection attempt failed because the connected party did not properly respond after a period of time, or established connection failed because connected host has failed to respond). Even though the test site was inaccessible for only 15 minutes and 38 seconds, the damage had been done. Site5 would not score a 100% uptime rating. 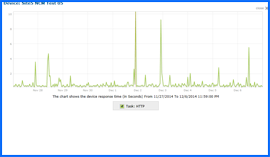 Further, average page-load speeds would be negatively impacted by the downtime. Site5 Speed Test Results Chart. The thin red vertical line indicates downtime. Click to enlarge. 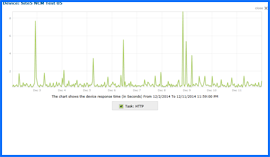 Site5 reliability and page-load speed concluded on 12/6/14 without further incident. Over the course of ten days our test site scored a 99.8914% uptime rating (see screenshot above right). 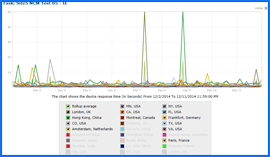 Worldwide page-load speed averaged a disappointing 2.2068 seconds. U.S. page-load speed averaged a substandard 1.8066 seconds (see screenshot right). As all of the server problems had occurred within a limited time period on a single day, we decided to look at results for an additional 10-day time period. The second test results would not be permitted to change our review ratings as we do not allow for “do-overs.” However, we also feel that it is important to provide our readers with as much testing information as possible so that they may make the best possible hosting choice for their own requirements. Site5 Uptime Re-test Results Chart. Click to enlarge. Had our testing begun on 12/2/14 and concluded on 12/11/14, Site5 would have scored a 100% uptime rating (see screenshot right). Further, 10-day worldwide page-load speed would have averaged 1.5221 seconds (see screenshot below right) — presently good enough to rank #12 on our list of fastest worldwide hosts. Additionally, 10-day U.S. page-load speed would have averaged 1.1271 seconds — presently good enough to rank #9 on our list of fastest U.S. hosts. Unfortunately, we do not make exceptions for “bad server days.” The first set of test results would be used to calculate Site5’s ratings and cumulative ranking. Site5 Speed Re-test Results Chart. Click to enlarge. Rated A+ by the Better Business Bureau, Site5’s shared web hosting plans are backed by a 99.9% uptime guarantee, a 45-day money-back guarantee, and 24/7 technical support. We loved every aspect of our Site5 hosting experience — except for the substandard page-load speed and reliability test results. It is worth noting that had our testing begun 5 days later, Site5 would have earned 4.5 stars and an unqualified “recommended” designation. Site5 has earned 4 stars and is recommended with reservations by NCM Online. Cheap website hosting company price comparisons based on 1-year term list price before coupon/promo codes or limited time/introductory offer discounts. These are the renewal rates for the second year of hosting. To ensure that you receive the most affordable Site5 pricing possible, please visit our Web Hosting Coupon Codes page for current discounts and special offers before making any purchases. Site5 is an accredited member of the Better Business Bureau and its website informs us that it “self-certifies with Safe Harbor” as a selling point. Site5 offers “high-end servers, low number of customers per server, and 50% less fat” (site5.com). Site5 prides itself on having conducted and continuing to conduct high levels of research by which their tech professionals arrive at the ratio of client to server quantities in order to most optimally perform at their most efficient. Site5 seeks to continually upgrade its hardware platforms for maximum, uninterrupted use. Site5 prides itself on having never outsourced its customer service support team in fourteen years of existence. Site5 claims no gimmicks, just straightforward and quality web hosting. Site5 offers a money back guarantee if the client is not completely satisfied for any reason. This video tutorial demonstrates the installation of WordPress on a Site5 shared hosting account using cPanel and the Softaculous 1-click applications installer.